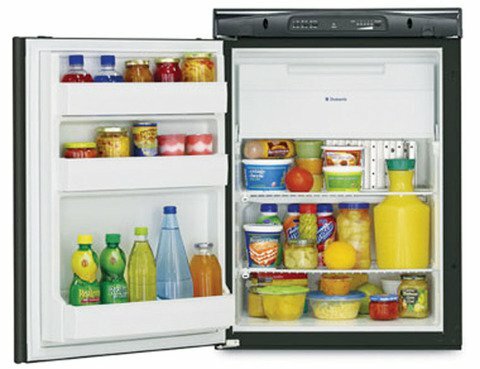 What is the best Caravan Fridge? 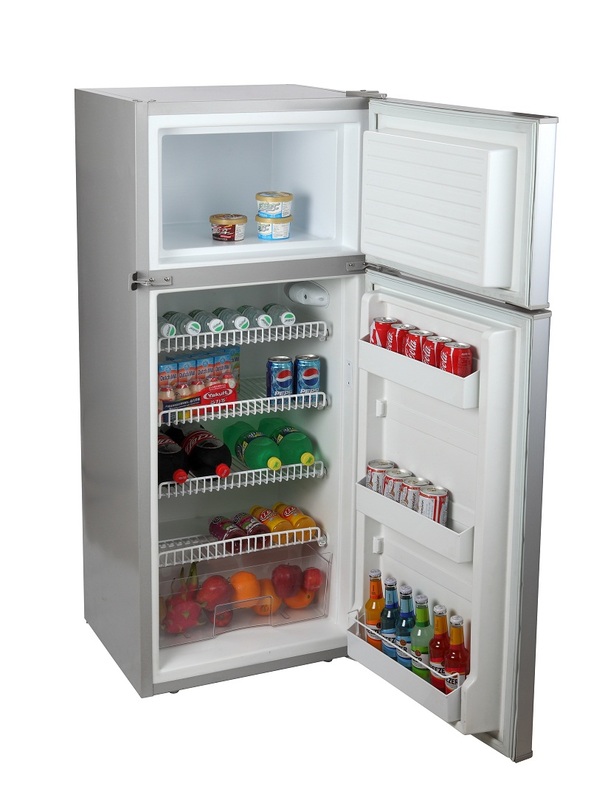 What is the most economical Caravan Fridge? 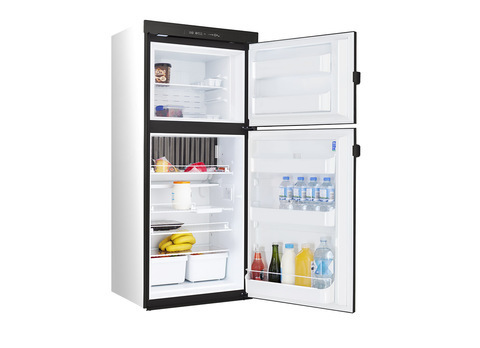 What is the best performance Caravan Fridge? 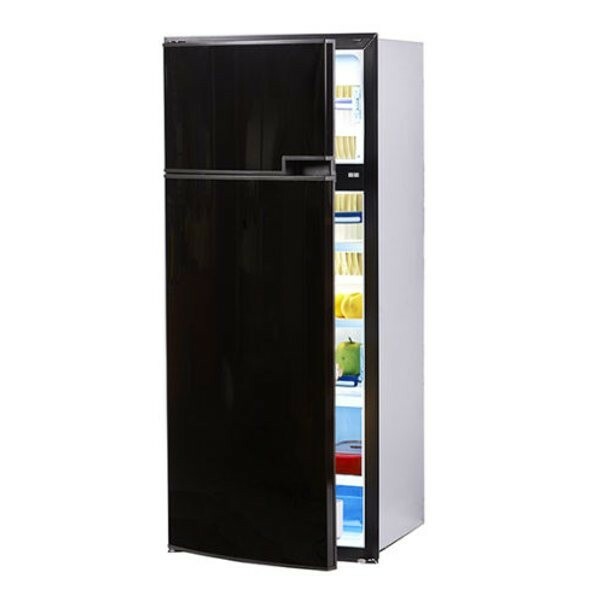 Or what size Caravan Fridge will suit my existing cut out or fridge recess? Then you have come to the right place where all that information in presented in the one place. If you prefer to talk to a real person, give us a call on 1800 787 278 (1800 RV PARTS) or email us at sales@caravanRVcamping.com and one of our friendly team members will be happy to help. Durable enough to stand up to rough travel over both land and sea. 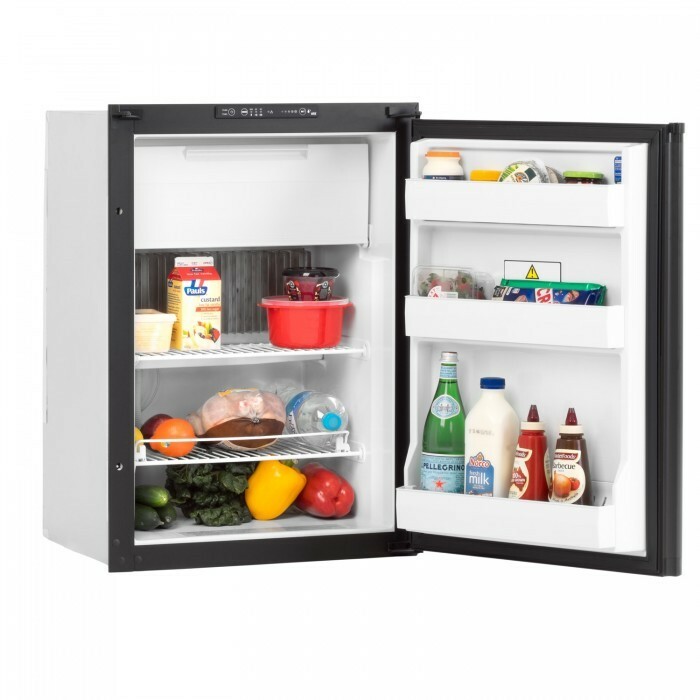 It can hold up to 62 Lt including the freezer compartment. 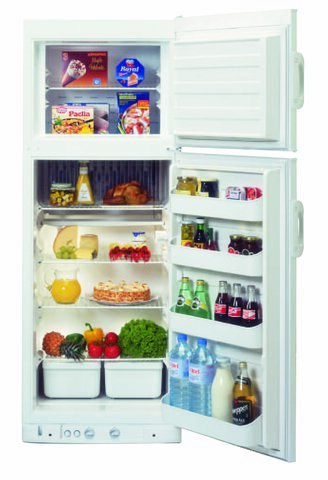 Steel lock keeps food from spilling out even in extreme conditions. Can run on both 12V and 24V batteries. Runs on both 12V and 24V DC power. 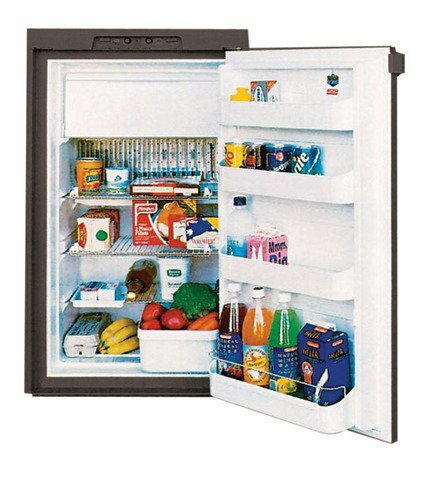 Reversible hinges for left or right opening door choice. 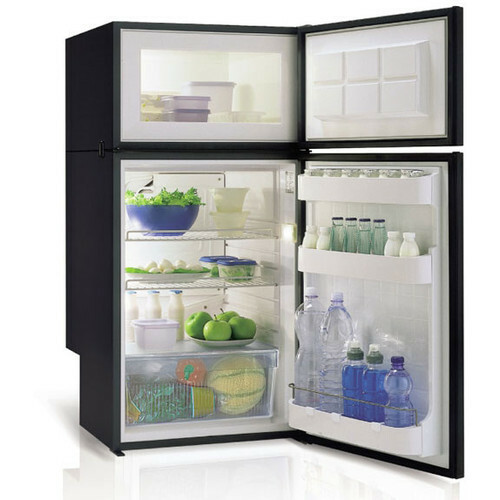 Reversible hinges allow you to change the position of the door as needed. Easy cleaning thanks to the drainage plug system. 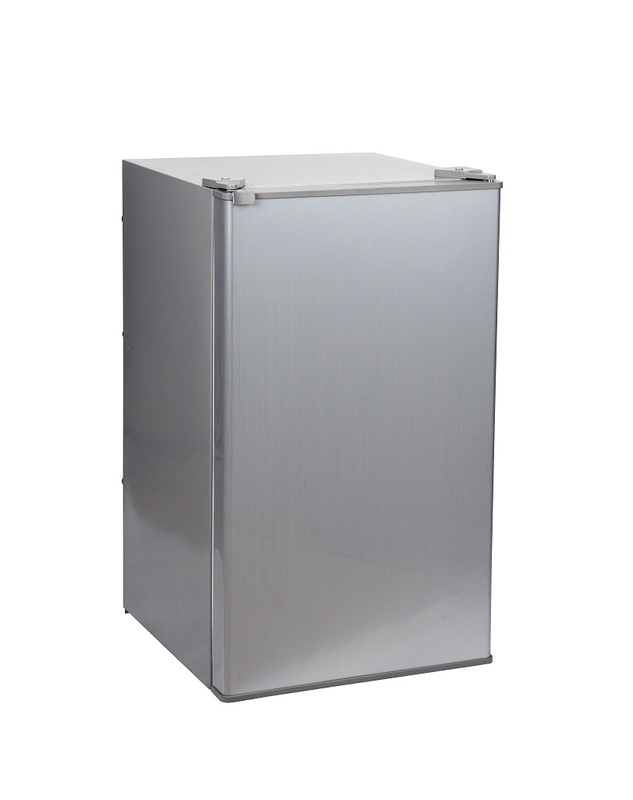 Designed for both boats and caravans and is built to survive rough conditions. 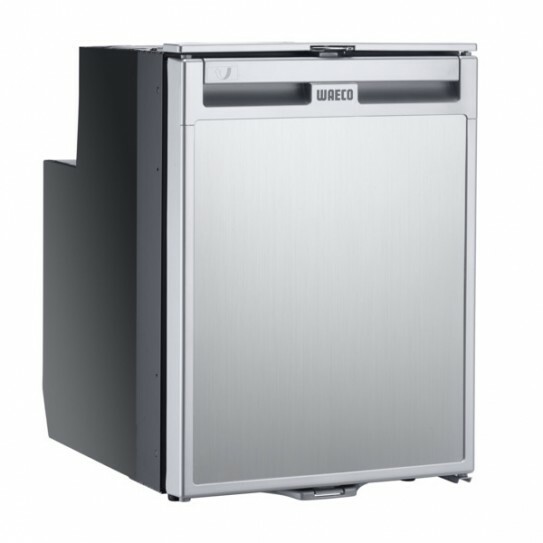 Power saving design prolongs better life while maintaining maximum cooling power. 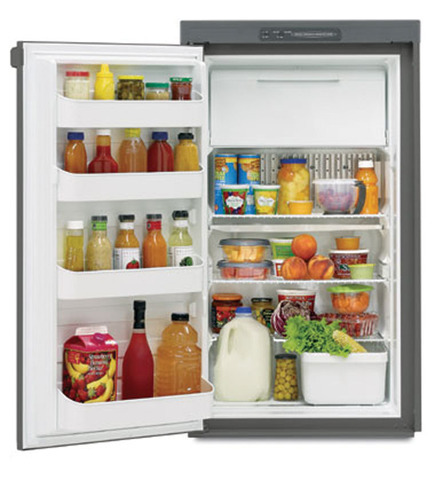 Air lock keeps fridge closed even in rough conditions. 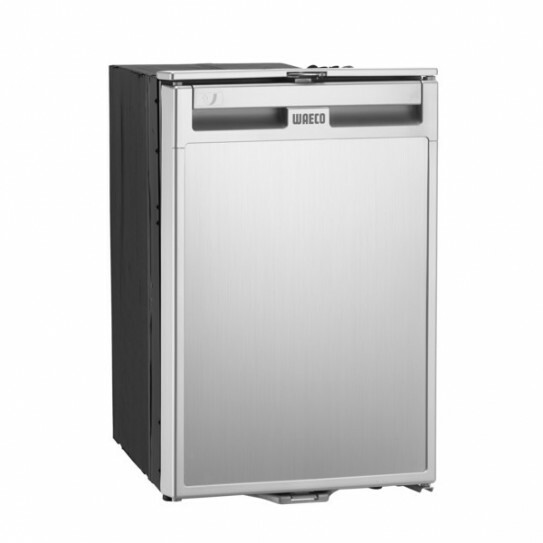 1.6m line allows compressor to be moved around to save space in fridge. Only one fitting frame for flush installation. 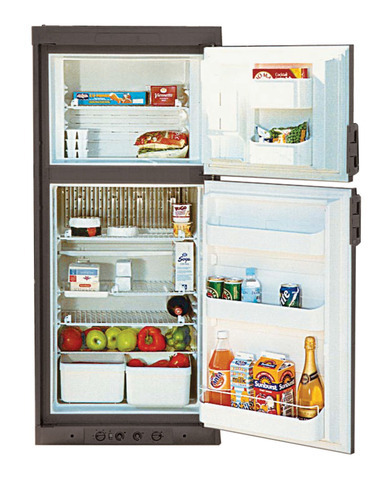 Suitable for use in both caravans and boats. 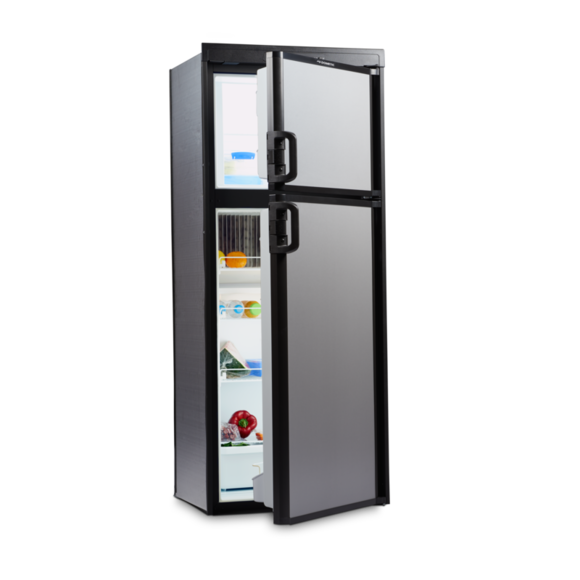 It can hold up to 85 Lt including the freezer compartment. 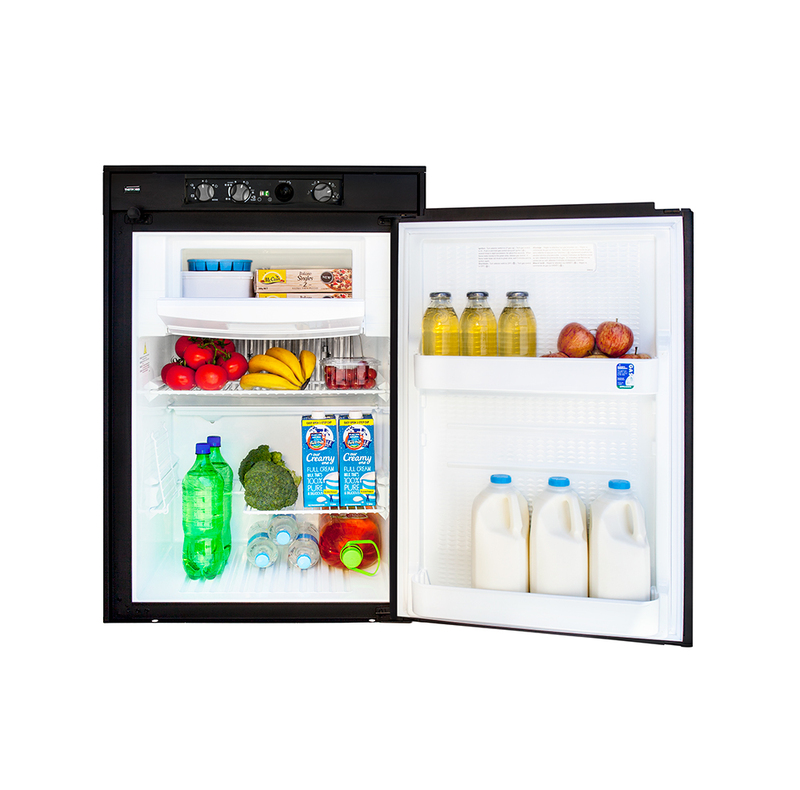 Replaceable door panel so you can customize your refrigerator to match your vehicle's interior. 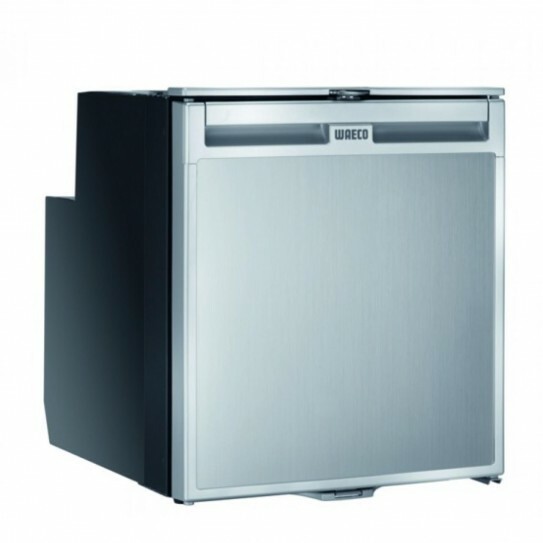 This refrigerator also features a drainage hose to remove unwanted moisture. 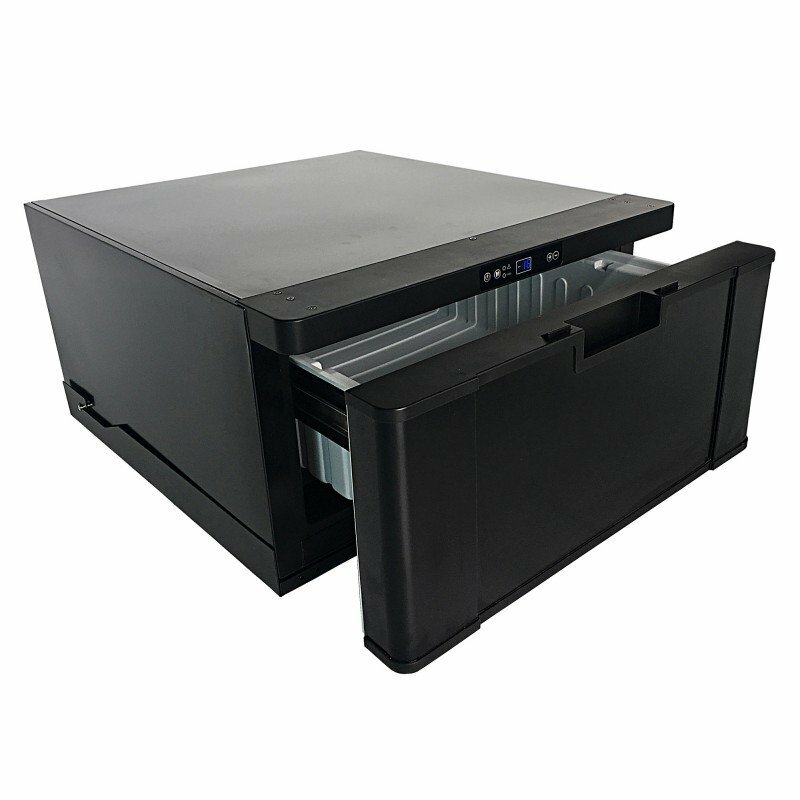 Supplied standard with a Turbo fan and black with black gloss door panel. 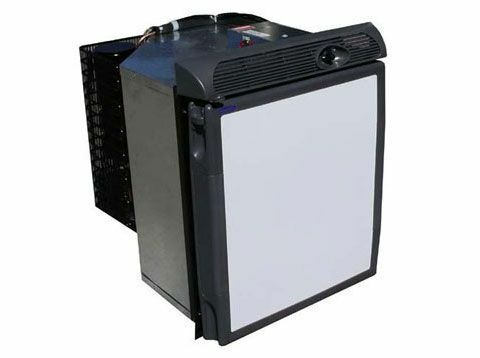 Runs on 12V or 24V power. 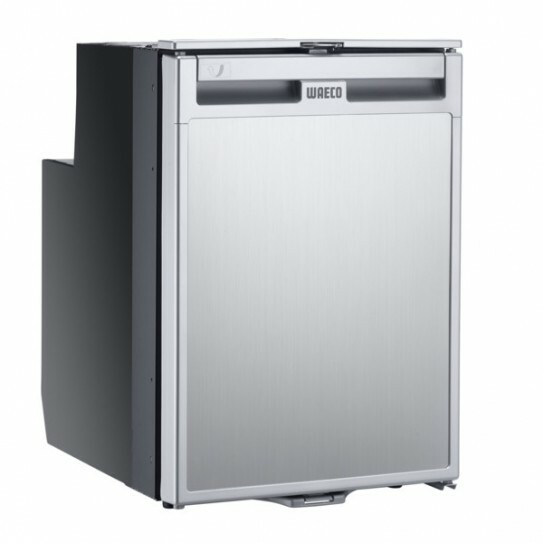 NOTE 2: standard and/or flush mounting frame must be purchased separately. 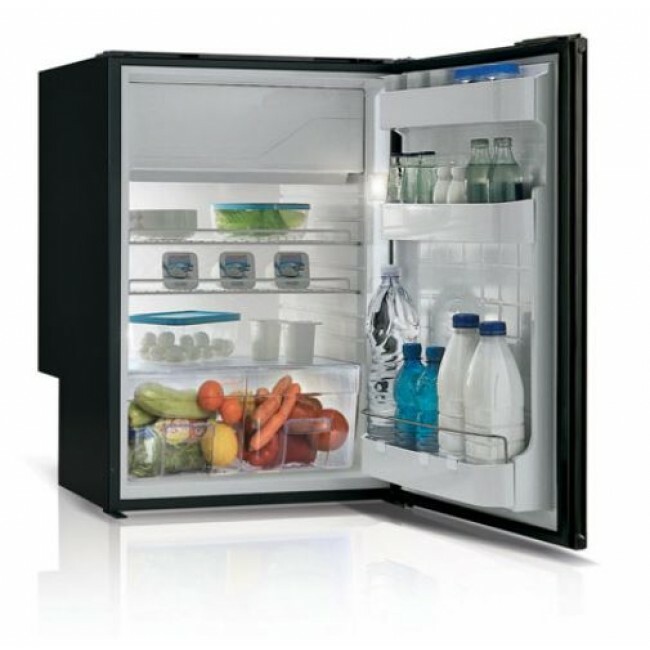 It can hold up to 115 Lt including the freezer compartment. 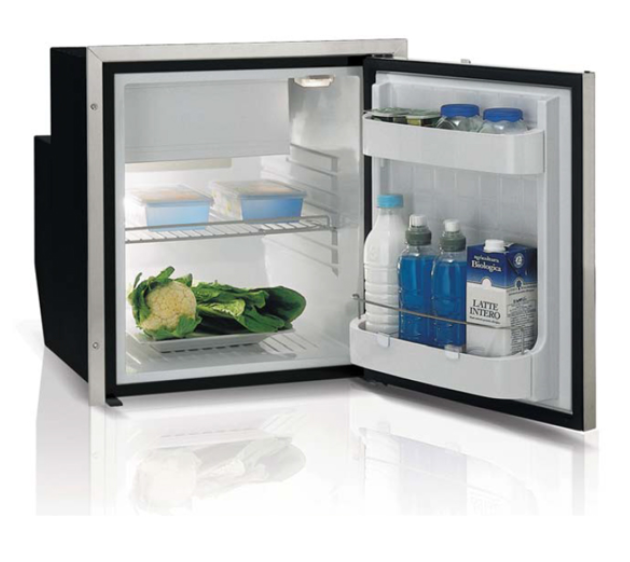 Sturdy Air lock system with ventilation keeps food fresh and secure even in extreme conditions. 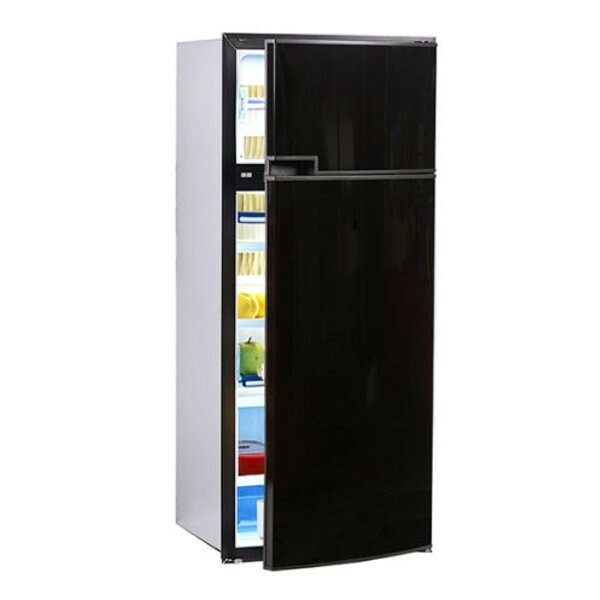 Flush installation with a 0.8mm Laminate door panel (as opposed to traditional 3mm panels). 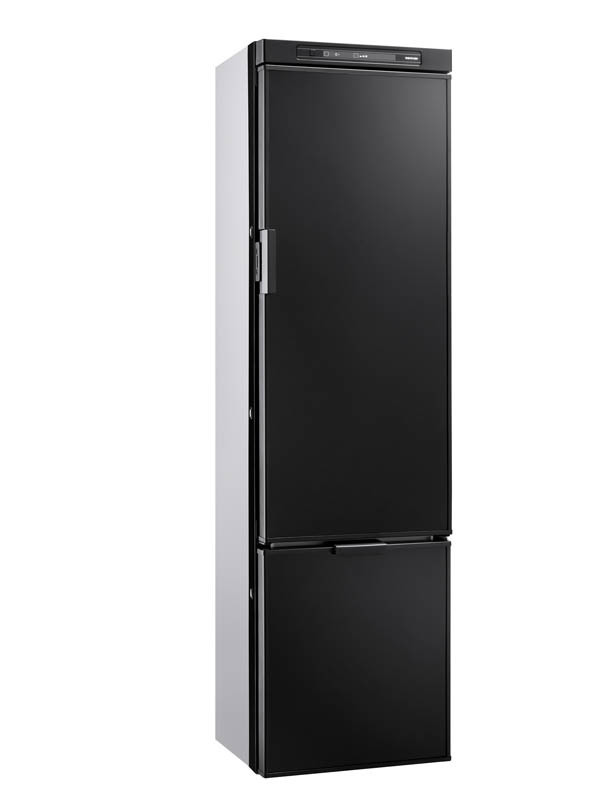 One fitting frame for both fridge door and front panel face. 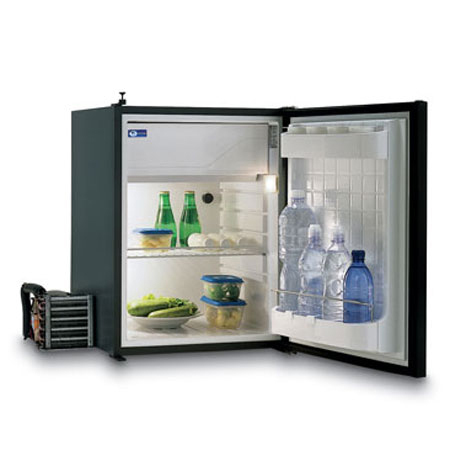 Built-in freezer in separate compartment with 3 Star insulated door. 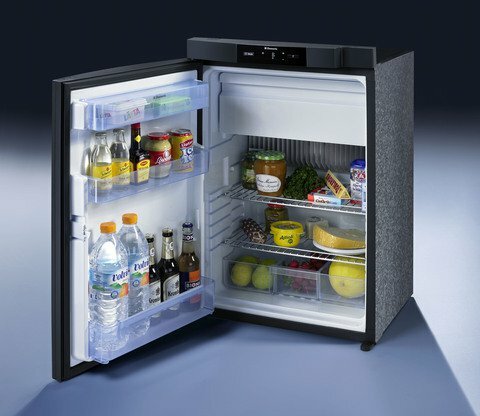 New Air Lock keeps fridge from opening due to rough terrain or sea travel. 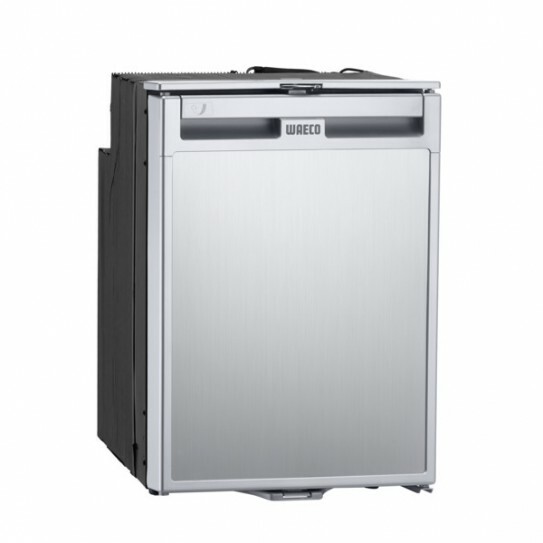 1.6m line allows compressor to be stored in well-ventilated place outside fridge. 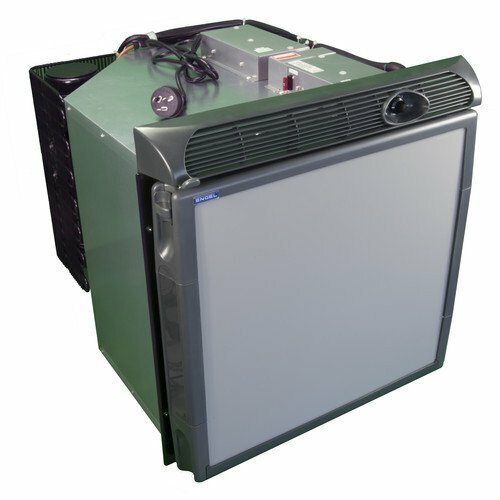 If you'd like to run your fridge off of 240V mains power rather than your caravan battery, use a 240AC Adaptor (see related products below). 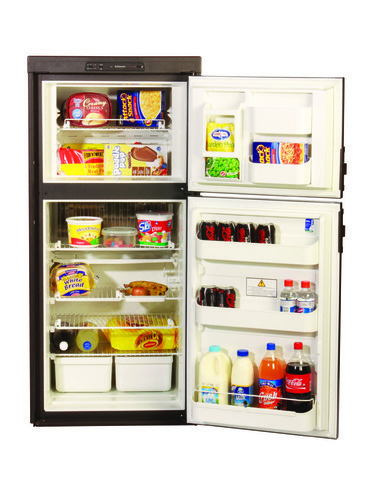 A lot of caravanners choose to purchase 12/24V fridges and combine them with an adaptor, as they generally use a lot less power than the 12/24/240V fridge combos currently on the market. 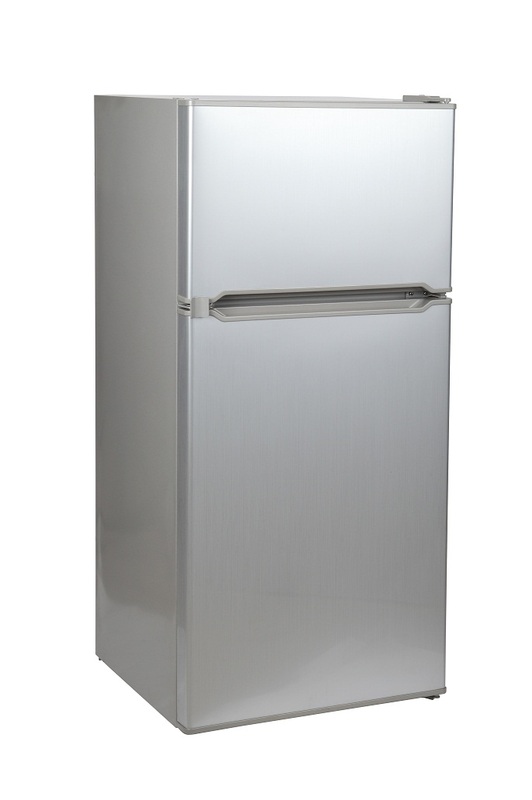 NOTE: sufficient ventilation - particularly at the rear of the fridge - is required for optimum cooling and efficiency. 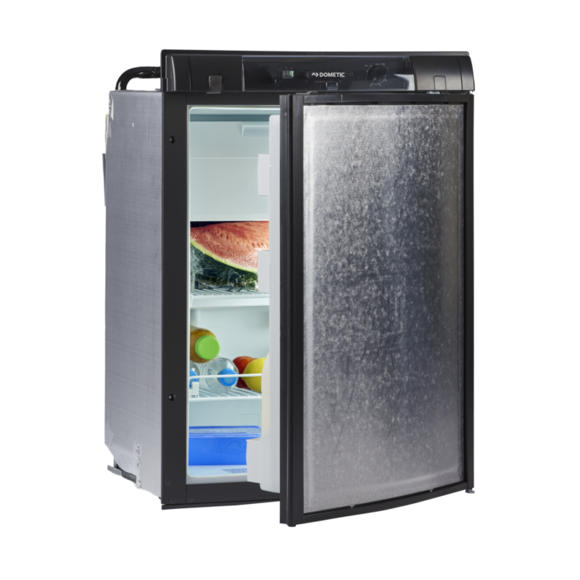 NOTE: sufficient ventilation - particularly at the rear of the fridge - is recommended for optimum cooling and efficiency. 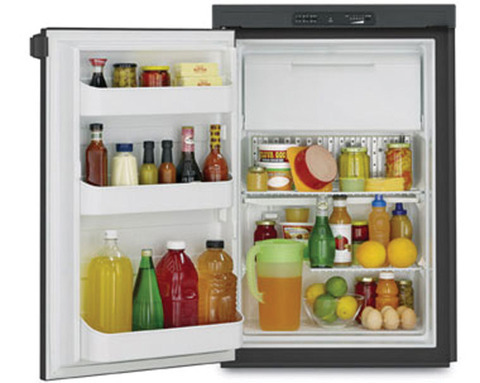 The fridge can draw up to 12amps on start up, so make sure your fused line and cabling is at least 6mm (10AWG). 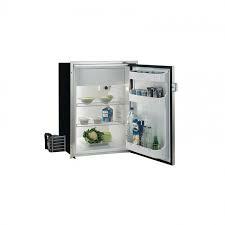 Can work with gas, mains or battery. 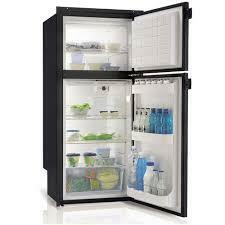 Comes with easy to use control system. 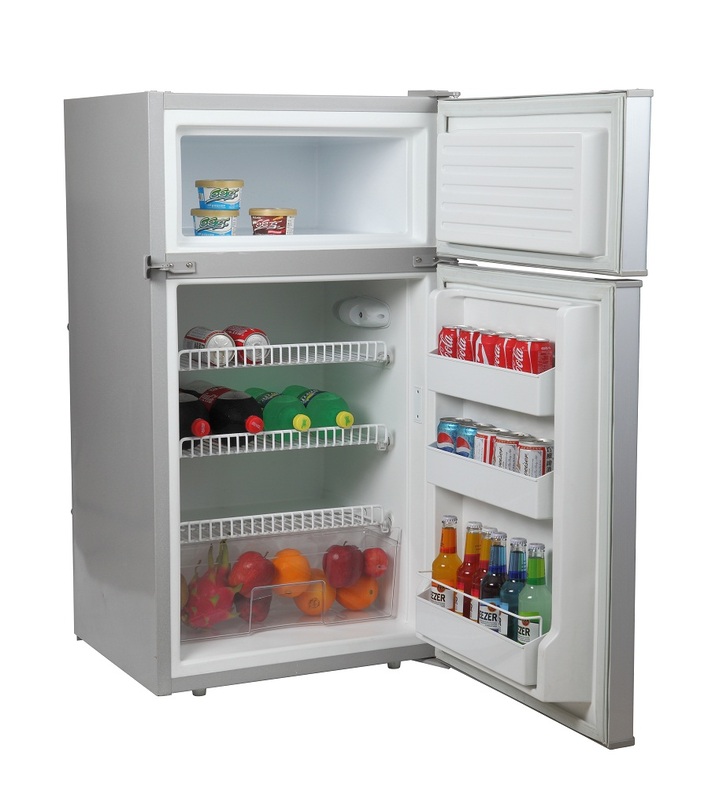 Adjustable powder coated shelves and free ice tray. Easy to see Gas flame meter. 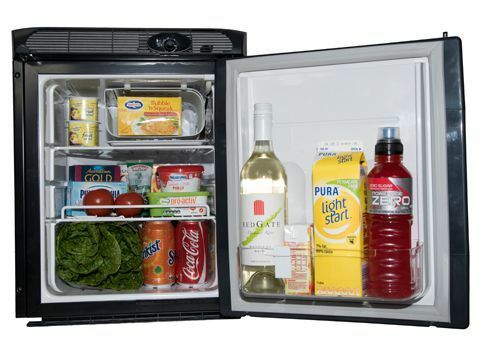 Patented fully removable freezer compartment allows flexibility of space according to your changing needs. 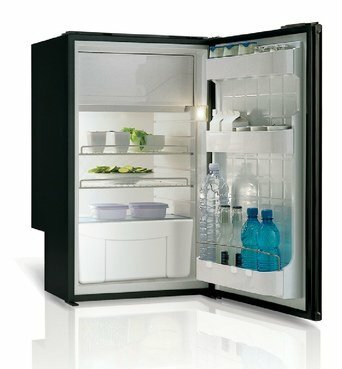 Save up to 20% energy when using in fridge only mode. 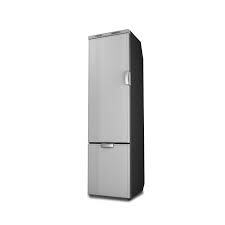 MES (Manual Energy Selection) gives the choice to operate it on 12V, 240V or gas. Automatic flame failure safety shut off. 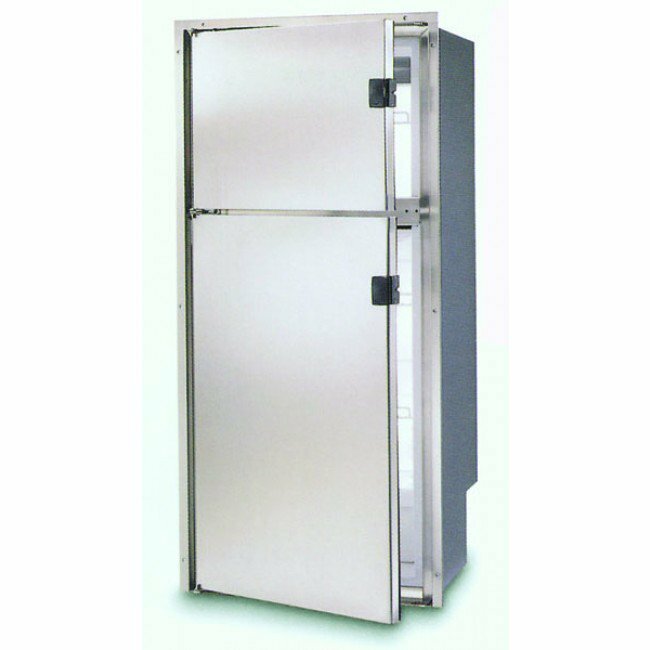 Thermostatic control available during 240V and gas operation. 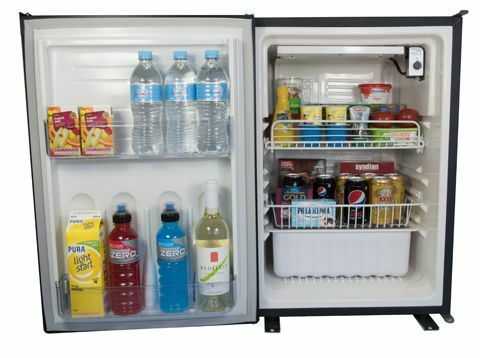 Cooling unit designed for Australian conditions. 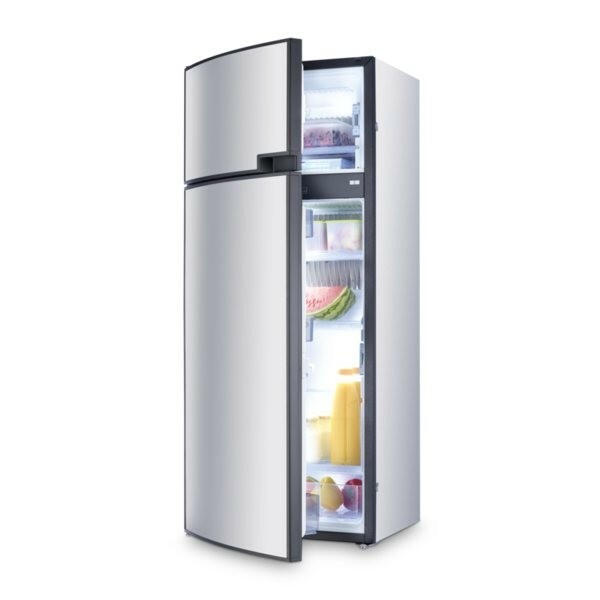 NOTE: Door skin not included. Laminate or 3ply to suit RV interior is your choice to make. 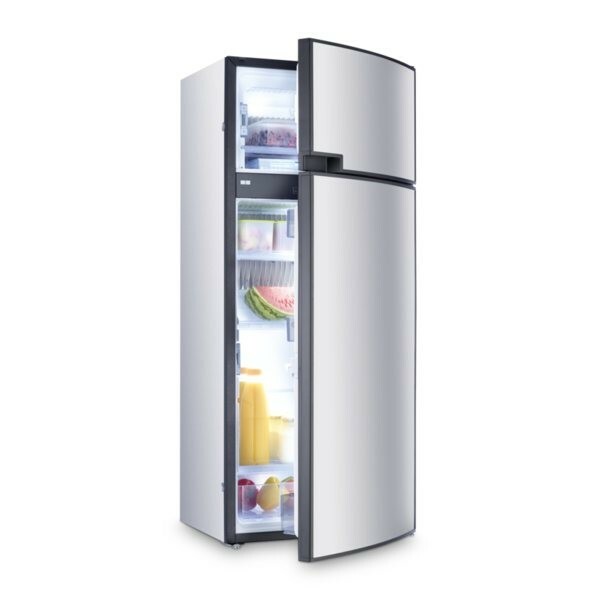 NOTE: fridge not supplied with external door skin. Buyer to supply the required laminate to match interior of the van. 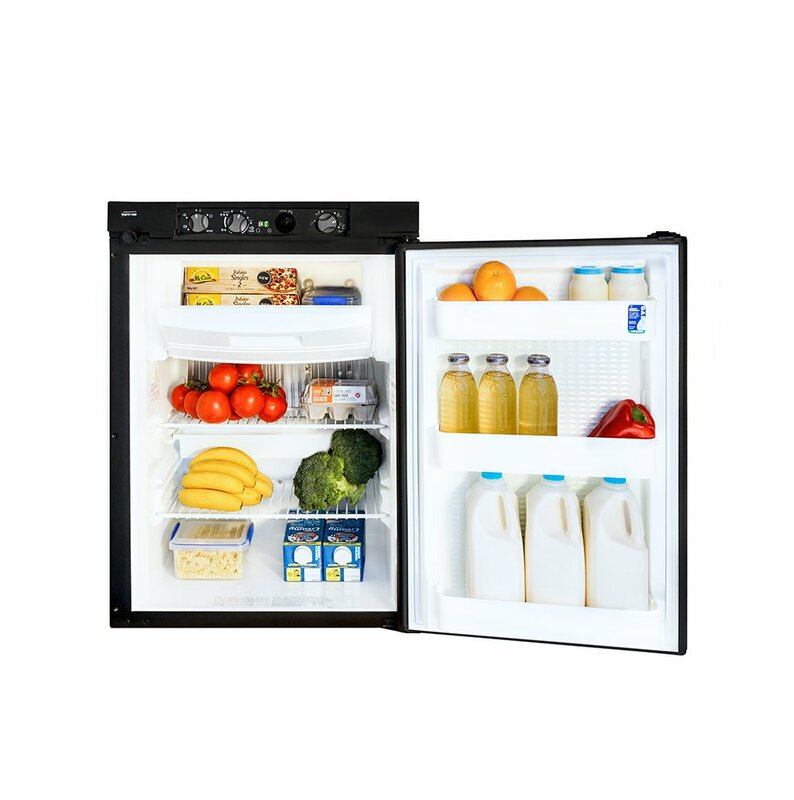 Anti-burst travel lock to keep the refrigerator securely closed on the road. Thermostatic control on mains operation. 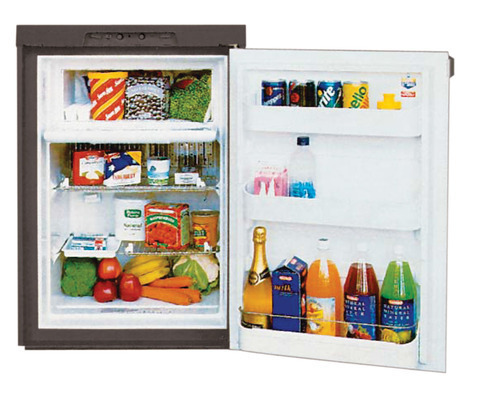 Replaceable door panels allow you to change the exterior look of your fridge to suit your decor.